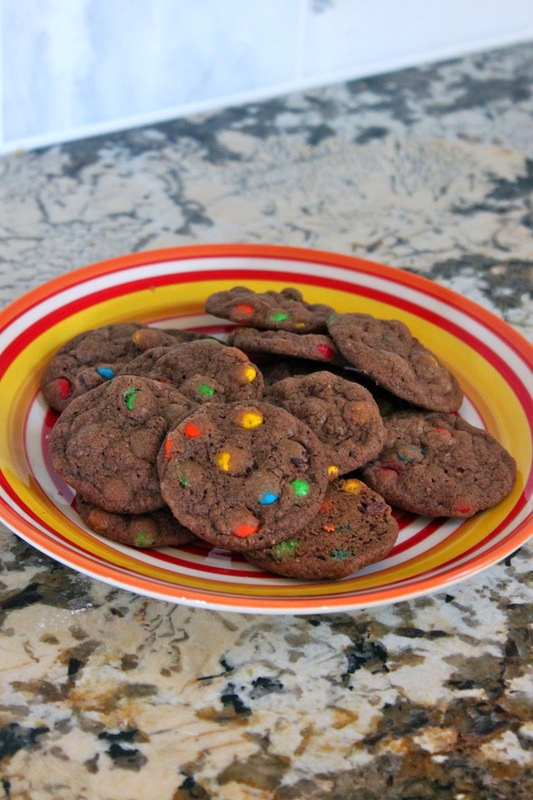 Baked Perfection: M&M's® Milk Chocolate Minis Cookies and We have a Winner! M&M's® Milk Chocolate Minis Cookies and We have a Winner! Happy Sunday, or shall we say Sundae. Before we get to these cookies I wanted to announce the winner to my "National Ice Cream MonthGive Away from Smucker’s®" The winner is Gloria who said "My favorite ice cream flavor is chocolate chip :)" Please email be at bakedprefection@gmail.com with your contact information so I can get the prize pack sent to you. In a large bowl, cream together the butter and sugars until well blended. Add the egg and vanilla and mix to combine. In a separate bowl, mix together the flour, cocoa powder, baking soda, and salt. Slowly add the flour mixture to the butter mixture until combined. Stir in the candy. Drop by rounded half tablespoon onto a baking tray about 2 inches apart. Bake 7-9 minutes.